With the introduction of new timetables in the Great Yarmouth area from yesterday, there have been some changes to the local First Eastern Counties fleet. Gone are four Darts and six Volvo B10BLEs which have been transferred to Norwich. They have been replaced by ten Volvo/President double deckers enabling the service 8 between Caister and the James Paget Hospital to become fully double deck and low floor operated. The incumbents are transfers from Norwich. Watch out for future photos of the newcomers on here and on my flickr site. I have just returned from a short break after spending three days in the West Midlands. I stayed in Coleshill on the eastern fringe of Birmingham. 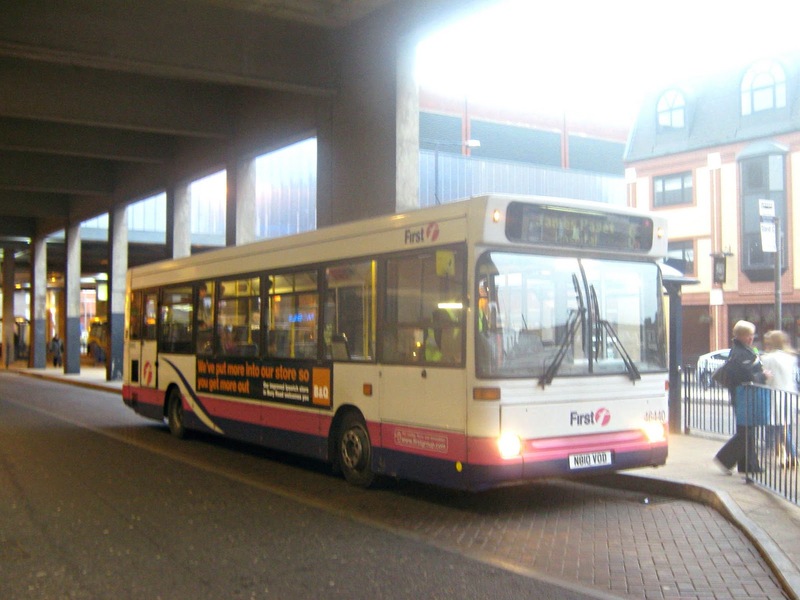 Coleshill appears to have two operators providing services there; National Express West Midlands and Stagecoach Warwickshire. Not one to miss a photographic opportunity, I decided to takes some pictures of operations there. The first (above) shows National Express West Midlands Trident 4626 (BX54XRR) on rute 90 in Coleshill's High Street. The second (below) is of Stagecoach Warwickshire's Omnicity 27542 (SN04EFM) on Coventry Road with the 752 service to Whitacre Heath. 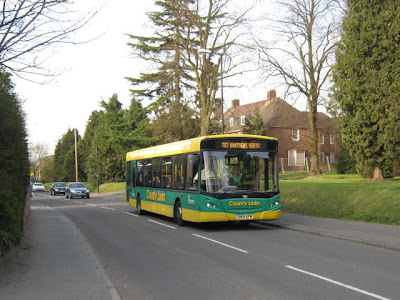 Almost all of the Stagecoach vehicles seen in Coleshill were sporting the yellow and green County Links livery. Both photos were taken on 24th March 2011 and we were very lucky with the warm and sunny weather - it was only March after all! The milder sunny weather brought a number of coaches to the Beach Coach Station this afternoon with four National Holidays' vehicles present. They were 57 (NH05CDH) and 59 (NH05EDH) (both shown above) plus 63 (YJ03VML) and 88 (YJ03VOH). A further two were noted at North Drive pick up point near the Britannia Pier - 8 (NH04JCH) (see left) and 70 (YJ03VMX). So a total of six (!) of the fleet were present in the town and all of them with 'Pontins of Pakefield' stickers in the window - so clearly an excursion from the Suffolk holiday centre. Not to be outdone, two Shearings vehicles were also seen; 213 (BF10VCD) was returning its passengers to the Carlton Hotel along Marine Parade whilst 513 (MX03ABV) was passing through Market Gates in the old livery. Friday and an opportunity to try out the new camera in Great Yarmouth town centre. Minutes later Lingwood-based DCP Travel's TIL7718 passed the Centre heading southwards. Not quick enough to get a photo! Another foggy/misty start to the day coincided with my weekly dose of Shearings vehicles. Earlier today, two of the group's vehicles were sighted at the town's Beach Coach Station; one in National Holidays livery and the other in Shearings Holidays blue. 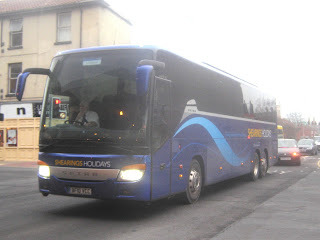 They were Shearings Setra 212 (BF10VCC) and National Holidays Volvo B12M 75 (YJ03VNC). The latter seemed to have a front tyre problem on the drivers side with a tyre company arriving shortly after I took the photograph. Monday started bright and sunny in Great Yarmouth but during late morning the cloud arrived together with the infamous cold easterly winds. However, I was not to be deflected and took up a new vantage point for pictures at the King Street/Regent Street corner in mid afternoon. The first to arrive was First Eastern Counties Gemini 37570 (AU58ETC) on the X1 to Peterborough. Wednesday appears to be the better day of the week to seek out any Shearings vehicles visiting the Great Yarmouth area. Today it was a very shiny 626 (MX04AFU) which had taken up residence at the town's Beach Coach Station. No it wasn't a visit from Barack Obama but the appearance of a First Eastern Counties President on a Lowestoft bound service! The vehicle was Norwich-based 33154 (LR02LXN) and is shown in Gorleston High Street yesterday lunchtime on a southbound 1A service. The added bonus was the rare appearance of something called sun! Grahame reports that Lowestoft Olympians 34155 & 34156 (P655/6UFB) were both on the forecourt of Caister Road depot on Saturday morning. 34156 has been on loan to Great Yarmouth for most of the week and was sighted on an early afternoon Bernard Matthews trip on 3rd March. It is believed that 34155 was probably present for an MOT. Also of note inside the depot was Essex BMC School Bus 68534 (LK54FNL). "ONCE again the Number 2 buses are still not running on time. I waited one hour in the week for it to come to go into town. This was on Trinity Avenue, Gorleston. Many times we have waited and it doesn’t show up at all. Knowing there are a lot of older people waiting in the cold is very unfair. They always seem to miss a bus out. If you say anything to the driver they just say it’s not their fault. Now I hear they might even take the 2 off all together. How are the older people going to walk up to the bus on Middleton Road in the winter. Is this another so-called cut of this government?" However, the 13.30 working did take place to days later on Thursday (3rd) and is seen shortly after arrival at Market Gates with Dart SLF 43478 (R478CAH). After two months of preparing this blog, I thought I would review what has happened since I first started it in early January. I initially thought that I would exhaust all content by the first fortnight in January - how wrong I was! Encouraged by the success of the X1 Blog and Andy's Bus Blog I have persevered with the project. I may not have posted every day but there has always been something to report on in the Great Yarmouth/East Norfolk area every few days. My thanks to Grahame for keeping me supplied with news and the offer of photographs for which I am extremely grateful. As for my audience, I had expected most (if not all) of the visitors to be from the UK and I was right in this respect. However, what I had not expected was a worldwide audience - the major number of visitors outside the UK have been from the United States (probably from a former Great Yarmouth resident) and Russia! Other European pageviews have come from people in Germany, Ireland, Italy and Poland. Other surprising visits have been from Bangladesh, Canada, Hong Kong, India, Indonesia, Malaysia, Morocco and South Korea. The other side of the world is not forgotten either as Australians and New Zealanders have also paid visits. Never underestimate the power of the worldwide web!!! Finally, thank you all for your interest as this encourages me to continue with this project. A photograph of a former Great Yarmouth Corporation Leyland PD2/1 No 66 (EX6566) is offered as reward for your continued interest! One of ten delivered to the town in 1949, she has been preserved at the East Anglia Transport Museum at Carlton Colville in Lowestoft. 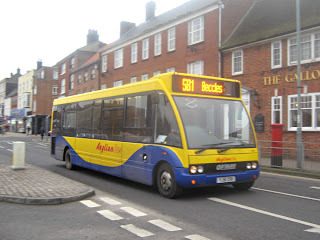 Please continue to revisit the blog for the latest pictures and information of bus activity in the East Norfolk area. The first day of March coincided with a spare couple of hours on a grey and overcast day in Great Yarmouth Town Centre. 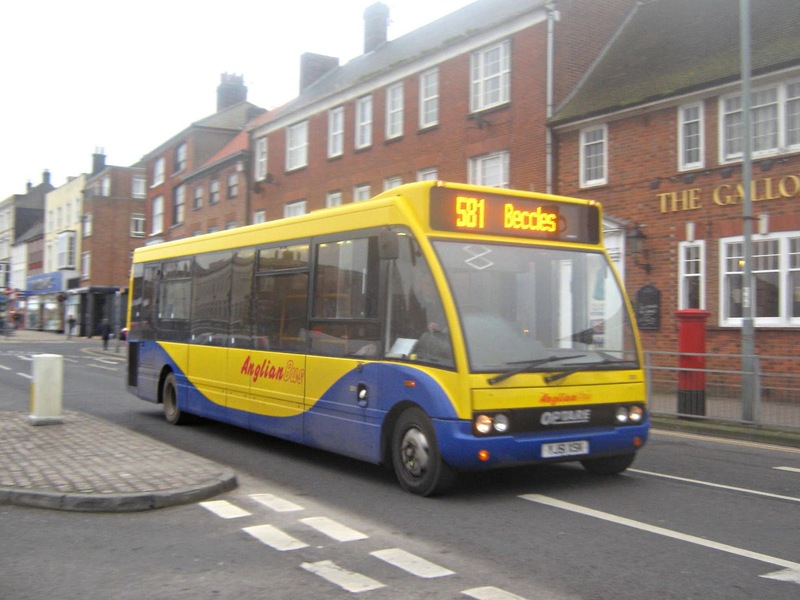 During that time Anglian's Optare Solo 301 (YJ51XSK) passed me in the Market Place on a service from Beccles. After some shopping I walked to the Market Gates Bus Station. It was there that Shearings Setra 212 (BF10VCC ) rolled past me on the through road thereby providing me with my weekly dose of the operator!. Luckily somebody was crossing the road at the time so it was going slow enough for me to get a reasonable photo. Later in the afternoon, as the light was fading, I finally managed to get a photo of First Eastern Counties newcomer Dart 46440 (N810VOD) which was working the 8's to the James Paget Hospital. Originally expected to be transferred to Clacton from Ipswich, it found its way to Great Yarmouth instead! Rumour has it that it also turned up at Caister Road last year but was rejected. Some of you visiting this busblog are probably already aware of the existence of Terminus bus magazine, a 32 page bi monthly publication from the Eastern Transport Collection Society. February 2011's issue contains four pictures photographed by yours truly and credited to east norfolk bus; including the two on the back cover shown left.